When I was helping a buddy of mine renovate some properties, we were surprised at how much work needed to be done in the garages. We were even more surprised when we saw how expensive it was to outsource that job. We wanted to do it ourselves, but we didn’t know where to start. We knew we needed to find the right materials, but we had no idea what the best garage floor epoxy would be. 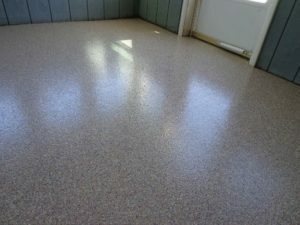 Finding the best garage floor epoxy isn’t as simple as picking the best paint for your kitchen. We needed to do a fair amount of research and try a few things out until we found out which ones were really going to work for us. If you don’t want to go on a wild goose chase trying to find the best garage floor epoxy, I encourage you to learn from our personal experiences. I’ve used Rust-Oleum products in the past and I’ve found just about all of them deliver on their promises. I’m always getting quality for an affordable price and that’s something I specifically look for when I’m shopping for renovations. My goal is always to stick to a reasonable budget and find things that will provide great results that last a long time. That’s why my experience with Rust-Oleum bumped this to the top of my list. It’s a complete kit, and it’s big enough for a 2 ½ car garage. I used it on a modestly sized 2 car garage and I still had enough left over to keep some for touch-ups in a few years, in the event that the garage floor needs a little pick me up after it’s been thoroughly parked on. It comes with decorative chips to add texture to the floor, so it isn’t a flat gray or a flat tan. We used the gray, and we decided at the last minute that we were going to add the chips to keep the garage from looking too much like a warehouse. I was skeptical that we would be able to get them to look as beautiful as they looked on the box, but we achieved it. Everything came out great. Another thing I love about using this is that Rust-Oleum also makes a non-slip additive. Since the washer and dryer hookups were in the garage, we were worried that if they ever leaked, the garage floor would be dangerous to walk on. The non-slip additive was simple to incorporate with the epoxy, and it worked out great. After we finished the garage, we hosed everything down to get rid of the dust and particles that accumulated from the work we did. We got the floor soaked in the process, and it was very easy to dry. This is the easiest garage floor epoxy I’ve ever used. I love the kit aspect because you save a lot of time and money trying to find everything you need. The instructions were clear, we waited the recommended amount of time before walking on the floor, and we didn’t need to do touch-ups. 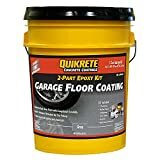 I would recommend this garage floor epoxy kit to anyone who doesn’t have a wealth of experience in home renovation or update projects. It’s easy enough for the average person to do it themselves, rather than spending a fortune on having a professional come in to handle the job. If you’re not the type of person who generally DIYs home projects, you’ll be able to handle everything all by yourself with this kit. It doesn’t take very long to do it, and if you mess up a little bit, you’ll have enough extra epoxy to fix small mistakes. 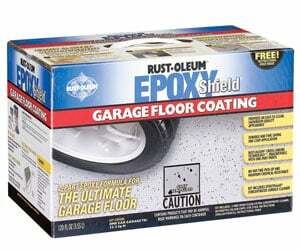 These are more than just garage floor epoxies – they’re great for almost any surface. They also come in colored varieties, which is the biggest appeal. A lot of people use garage floor epoxy to seal concrete floors in basements and warehouses, and that’s exactly what I used this for. I put in in a basement that needed to look a little more like a living space than a garage ordinarily would. The color selection in this is awesome. There’s the whole range of natural, neutral tones that you would expect from any basic epoxy, but they also have a lot of fun bright shades. I used the yellow to finish a basement that would ultimately become an area for kids to use to play and study. It needed to look a little more creative and welcoming than a flat gray or tan could make it. I’ve had some bad experiences with brightly colored epoxies in the past. A lot of the time, the color comes out uneven. It has a tendency to make small imperfections extremely noticeable because the contrast between the concrete and the epoxy is very obvious. Since most colored epoxies aren’t very opaque, it’s harder to get things to come out the way you want. That didn’t happen with this epoxy. I only needed two coats, but I expected I would need three. It needed minimal touch-ups for everything to look smooth and uniform. Is now my go-to epoxy for whenever I need to do something special. It’s a lot easier than painting and then sealing the paint with an epoxy. I can get everything done all at once, and I don’t need to buy a ton of extra stuff to achieve what I want to achieve. It might take two coats, but it’s still a lot more efficient and practical than adding a bunch of steps to the process. Since you can even use this on plastics and countertops, it’s very easy to coordinate. Everything can come out the exact same shade with the exact same finish, and there’s no reason to go crazy trying to match shades in totally different products. It’s one-and-done. If you have an unconventional idea in mind, like a bright blue garage or basement floor, this epoxy is going to deliver for you. It’s going to save you time and money in the long run by making the process convenient and a lot less complicated. You’ll be able to achieve the results you want, especially if you’re willing to do two coats. You’ll have the floor you want in a couple days after everything has dried. The space will look a little more alive and the reflective surface will make your garage (or basement) look a little bit brighter. VERY FLEXIBLE 100% Solids, odorless, The coverage per gallon is between 125 Sq.Ft to 170 Sq.Ft per Gallon rolled out and depending on the profile of the floor. SURFACE APPLICATION: Plywood, Concrete. bar tops. This is the same epoxy that comes with the deluxe kit, but it doesn’t contain as much. If you’re not trying to cover a giant garage floor, you might not want to opt for the bigger kit. You’ll have epoxy coming out of your ears, and nobody likes to be wasteful. This kit can cover between 300 and 400 square feet. I used it in a 400 square foot garage, and I didn’t even run out. The tan semi-gloss finish is beautiful. In fact, it’s so beautiful that I think it would even look nice in an office. The white, gray, and black colored chips that come with the kit were easy to spread and added dimension to the floor. I didn’t have to deal with any bald spots or touchups – I was able to get it right the first time. I used this in my own garage. It’s designed to protect against hot tire pick-up, which was the problem with my old garage flooring. I don’t know if it’s just me, but I got a lot of tire pickup on my garage floor. This doesn’t peel or yellow the same way that cheaper epoxies do, and I feel like it stays looking new for longer than a lot of similar epoxies. My garage floor looks like a professional finished it. That’s what I’m most proud of. It doesn’t dry in the container as fast as some of the other epoxies, requiring you to mix up multiple batches and hope for the best. The project is seamless, and the whole floor comes out looking like a solid piece. The semi-gloss finish looks so nice that I didn’t even feel compelled to throw a clear coat on top. It’s been on for a long time now, and I’ve yet to notice any chips. The finish hasn’t worn away, and there’s no reason to do any touch-ups. All of the tools and small splatters from my overzealous paint job cleaned up perfectly with xylene. Since the surface is water resistant, I use the gentle spray setting on my house to flush all the dirt out of my garage every few months. It’s low maintenance and it holds up beautifully. I love using this kit because it’s almost impossible to mess up. Even if you’re the kind of person to drag your feet and work kind of slowly, the epoxy won’t harden in the container before you’ve had an opportunity to use it up. It’s dummy proof, and you’re getting a superior result. The kit makes it convenient, and you don’t need to run out to the store because you’ve forgotten something. 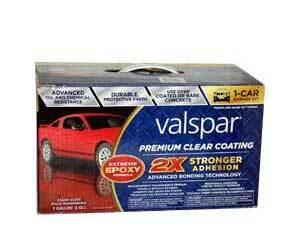 This is my go-to epoxy for single-car garages that need a little more work to look complete. It’ll turn your garage into an area you’re happy to spend time in it, and when everything looks as nice as it does, you might even feel compelled to keep your garage a little more organized. I was very enticed by the grab and go aspect of this kit. It’s all bundled in the perfect mixing bucket. You’re getting the epoxy, cleaner, etcher, degreaser, optional color flakes, and a stir stick. Just pick up the bucket and take it to the garage. Boom. You don’t even need to think about anything or purchase separate components to make everything work. It feels like the lazy way to do things, but you get excellent results. The kit covers about 200 square feet nicely, so it’s perfect for small garages. Since it’s gray, if you’re working on plain concrete, one coat does the job. You might want to get two kits for two coats if you’re covering over a really noticeable color like red. If you ever need to touch it up, it’s the perfect shade of gray. Everything blends seamlessly and it’s completely self-leveling, so you can just toss more on top and let it work its magic. I purchased two kits thinking I would need two coats, but I didn’t. It worked out perfectly with just one. I wanted to use the extra kit, so I coated the actual driveway. That’s what surprised me most – the way it performed in the driveway. I created a seamless transition from the street to the back wall of the garage, and it was really easy. I just put some old boards around the edges of the driveway to keep the epoxy where it needed to be, and it cured quickly in the sun. 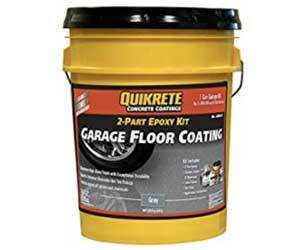 Unlike most epoxies, the Quikrete instructions specifically state that it works best when applied to damp concrete. That made the process so much easier. I didn’t have to wash the concrete, wait a full day for it to thoroughly dry, and then start the process. I was able to wash it early in the morning and start finishing the concrete before the sun started to go down. That’s exactly what sets Quikrete apart from its competitors. If you consider yourself to be a little on the lazy side, you can get a great result quickly with this garage floor epoxy kit. It simplifies the process a lot. You can wash your garage floor and paint it all on the same day, so there’s no need to drag the process out. This kit makes it easier to just get it over with. There’s no troubleshooting or complicated instructions. It’s the easiest way to turn finishing your garage floor into a quick process. This epoxy kit is perfect for two specific kinds of projects. If you want to paint your garage floor a color that you can’t find in a tinted epoxy, you can paint the garage floor and use this clear epoxy to seal it. It’s also great for people who don’t actually want to change the floor – they just want to seal it and make it easy to clean. I’ve used it both ways. I redid a garage with a checkerboard floor, like a racing flag. Since tile or linoleum isn’t ideal for garage floors, I needed to tape it off and paint it. When I was done and the paint was dry, I threw the epoxy right on top. When everything was finished, the garage looked like a place suited to working on formula one race cars. I’ve also used it to touch up garage floors that lost their shine. After a long time, colored epoxies begin to dull down, even if they don’t chip. A new clear coat makes it look like a whole new floor, but there’s a lot less work involved. It’s also great for basic waterproofing. If you just want to seal the concrete and prevent cracks, all you need to do is put clear epoxy on top. You can mop oil stains off the floor and sweep the dirt off a lot easier. Even though this is a one car garage kit, I still had some left over. If you have an especially large garage, it may be worth buying two. If you have a regular one car garage that’s a little on the large side, you’d probably be able to make due with a single kit. It spreads around like warm butter, and the glossy shine makes it super easy to see if you’ve missed any spots. Just hit it with a flashlight and push it around with the roller a little more. 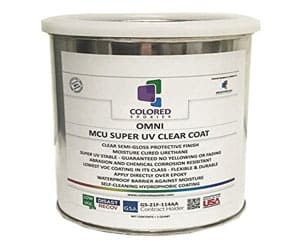 This can be put over any kind of epoxy or any kind of cement. I’ve relied on this to do a topcoat over colored floors with paint chips when the floor looked like it needed a glossier finish, or like the epoxy went on a little too thin. This is a staple product for me – I always like to have some around when I know I’ll be working on concrete. I never know when I might need it. This is the ideal clear epoxy. There isn’t much you can’t do with it. It makes custom color jobs a lot easier, and it rejuvenates old epoxy that doesn’t look as shiny anymore. It’s a quick fix to a variety of problems and it simplifies complicated jobs. If you have any leftover, you can use it to waterproof any concrete surface, so none of it will go to waste. I never run out of uses for this stuff, and it inspires me to be a little more creative. Epoxy isn’t like regular paint – it’s a chemical mixture that needs to cure. It’s thicker, and a little more complicated to work with. If you’ve never bought your own garage floor epoxy before, it can be hard to figure out how to handle the project on your own, and which one is going to work out the best for you. How Do I Epoxy My Garage Floor? How Long Will My Epoxy Garage Floor Last? How Many Coats of Epoxy Do I Need? 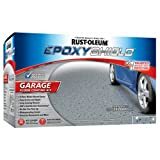 How Much Epoxy Do I Need For My Garage? The actual application of the epoxy is easy. It’s the steps that lead up to it that are a little more complicated. If your garage floor is new concrete, you have to wait at least 60 days for the concrete to fully dry, even if it looks dry. If it’s dry and clean, you’re probably all set. It gets a little more complicated when you’re putting epoxy on an old garage floor. If the floor is sealed, you need to strip off the sealer with chemicals or a machine. You’ll know it’s sealed if you pour water on it and it doesn’t absorb. If the floor isn’t sealed, you need to get all of the grease and dirt off of the floor. This is a lot of sweeping, and it might require some chemical solvents to remove gunk and oil. This is sometimes called etching, and sometimes, epoxy kits come with their own etching solution. You might also want to pressure wash the floor when you’re done to remove any residue. If the concrete is smooth, you might need to rent a piece of equipment to rough it up. Epoxy needs something toothy to hold onto. If it has a plain old gritty concrete texture, you’re good to go. All you need to do is wait for the concrete to dry completely. That might take a whole day. Some epoxies are safe for use on slightly damp concrete, but make sure you read the directions before you assume. If it won’t work on wet concrete, you’re going to wind up with a mess that’s really hard to fix. When you have the concrete prepped, all you need to do is follow the box instructions. A lot of epoxies work differently. Some will require you to mix up a smaller batch, use that to cut in the corners, and then mix the rest. Some epoxies will last a little longer and don’t need to be mixed in small batches. The instructions will tell you. Epoxy can be applied with a special paint roller – you won’t need to buy anything complicated to do it. Epoxy dries best when it’s warmer outside – if you do it in the winter, it’s probably going to get messed up. It’s perfect between 60 and 80 degrees, so pick a day when you’re comfortable outside in shorts and a tank top. Most epoxies will be safe to walk on about 24 hours after you apply them. They’ll usually take 3 or 4 days to dry to the point where it’s safe to park your car on them. Don’t chance it, even if the epoxy seems to be finished. The weight of your car can slightly crush the surface of the epoxy and leave permanent tracks. Check it over to make sure you didn’t miss any spots. It can sometimes be hard to tell until the floor is dry whether you’ve left some bald spots or you need a second coat. After it’s dry, it’s totally fine. You can sweep it, mop it, and move in all of your heavy tables and appliances. 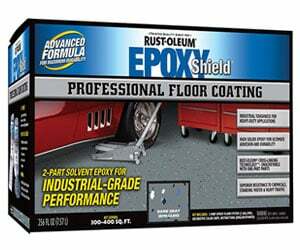 Most newer epoxies are designed to resist the damage hot tires can do, so you won’t need to worry about cleaning that up. It’s easy to maintain epoxy garage floors – the spills wipe right up. This isn’t a straightforward question to answer. At the very minimum, you can expect five years out of your epoxy garage floor. A lot of people make the mistake of believing that epoxy is impervious, and while it’s pretty strong, it isn’t the toughest thing in the world. If you use a spill a lot of chemicals in your garage, like chlorine, bleach, oil, coolant, antifreeze, or basically anything you would need to service a car, you need to clean them up promptly. If you let them sit, they’ll slowly start eating away at your epoxy floor. Keeping it clean is a must for a long life. A well-maintained epoxy floor will last anywhere between 10 and 20 years for the average person. It all depends on how rough you are on your floor, and if you spend a lot of time out in your garage. If you only park your car in there, your floor might even last 30 years before it starts to look a little beat up. As long as you’re taking care of it, it’s safe to expect a minimum of ten years before your garage floor will need a touch-up. That would be on the lower end of average for people who don’t mind cleaning as they go or avoiding things (like dragging metal, appliances, furniture, or tools) that common sense would say might damage the floors. Epoxy floors with a high gloss finish are usually slippery. If you sometimes forget to close your garage when it’s raining, or if you keep your washing machine in your garage, you might be concerned about the finished floor surface. If you’re worried about the texture, most brands that make epoxy also make a non-skid additive. It’s a granulated substance that you mix into the epoxy that gives it a little bit of texture. It puts a slight fog on the finish, but you won’t need to worry about sliding around in the water. It’s also a good idea to put that non-skid additive in basement epoxy floors. If you’ve ever dealt with leaky pipes or water trying to sneak its way into your basement, you know what a headache that can be. That additive will make you feel a little safer when you’re dealing with water. How many coats of epoxy you need depends on exactly what you’re trying to do. If you want a color on the floor, you might need two coats to make it opaque. Colors like gray and tan are very popular because they blend in with the color of concrete. You might be able to get a perfect finish in one solid coat because these shades are forgiving. Red epoxy garage floors are very popular. Since red is a less forgiving color and its sheerness will definitely be noticed, you might want to opt for two coats. Epoxy actually comes in a whole rainbow of colors. It’s safer to assume that the brighter the color, the more coats you’ll need. If you’re venturing outside a neutral palette, plan for at least two coats. The box will say how many square feet the kit or gallon is designed to cover. If you want to know how much epoxy you need, you need to know the square footage of your garage. That’s easy to do. All you need to do is get out your measuring tape. Measure the length of the garage, and measure the width of the garage. Multiply those two numbers together. If your garage is 26 feet by 26 feet (which is pretty average for a two car garage), your garage is 676 square feet. If you know you’re going to need two coats of epoxy, you’re going to need enough coverage for 1352 feet. If you don’t want to buy that much at once and you aren’t sure that you’ll need two coats, get your first epoxy kit, see how it goes, and after three days when it dries, get another one. If you have any left over from the first kit and you only need a few spots touched up, you might not need to buy more. I like all of these garage floor epoxies for different kinds of jobs. Using the right materials is a huge part of getting things done right the first time, and that’s why it’s important to consider what you’re trying to do before you purchase the best garage floor epoxy. Out of every kind of job I’ve done, I find that these ones are perfect for their intended uses. All you need to consider is the look you’re going for and the size of your garage, and then you’re ready to finalize your decision.